It seems that there is no man audiences are more eager to watch navigate a dire situation than Liam Neeson. 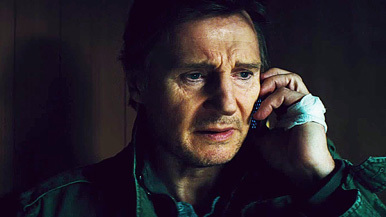 In the last year or so, the Irish actor has been made to put everything on the line in four films: Non-Stop, A Walk Among the Tombstones, Taken 3 and this weekend’s entry in the Neeson action collection, Run All Night. During that timeframe, he also parodied himself and his gruff-guy-with-a-great-voice persona twice, in The LEGO Movie and A Million Ways to Die in the West. At this point, he’s his own cinematic universe — in spite of the fact that no one can really pinpoint why. Neeson is an above-average actor with a clear charm and a dynamic (and thoroughly imitable) voice. When it comes to action films, though, he’s no more qualified than any other 60-year-old leading man — and yet has been molded into a punch-throwing, gun-toting force of nature on the silver screen. We’re not going to be able to define it, so we might as well just roll with it. Here, he’s washed-up thug Jimmy Conlon, kept on the payroll by boss Shawn Maguire (Ed Harris) as a favor. Jimmy’s son Mike (Joel Kinnaman) wants nothing to do with his lowlife dad and supports his family as a limo driver. Mike just so happens to take a fare from two European mobsters looking for cash from Shawn’s son Danny (Boyd Holbrook), who responds to the request by killing the toughs in full view of Mike. Danny wants to keep Mike quiet, Mike wants to stay alive, Jimmy tries to sort things out, yada yada yada, Jimmy and Mike have to re-bond while escaping vengeance.